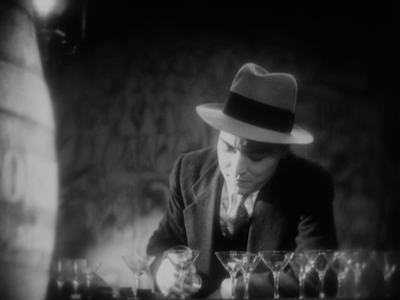 The most straightforward, and yet most complex, entry in the Silent Ozu - Three Crime Dramas set from Criterion’s Eclipse imprint is 1933’s Dragnet Girl, a dual drama about families and relationships and the effect the criminal lifestyle has on the ties that bind. Joji Oka (No Blood Relation [review]) heads the cast as the charismatic gangster Joji. 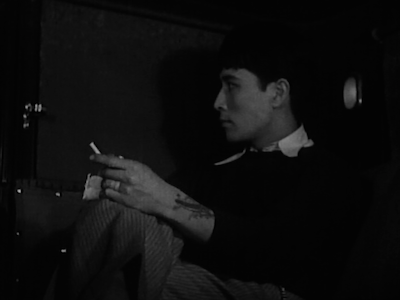 Formerly a boxer, Joji stepped out of the ring when he fell in love with Tokiko (Mizoguchi and Kinoshita mainstay Kinuya Tanaka, who also appeared in Ozu’s Equinox Flower [review]). Tokiko is a tough cookie in her own right, but she prefers a more domestic crime partnership that doesn’t involve her man getting pummeled on a regular basis. Though Joji has many would-be suitors, Tokiko chasea them all off, thus making it all the more surprising when a nice, quiet girl sneaks in and legit steals Joji’s heart. 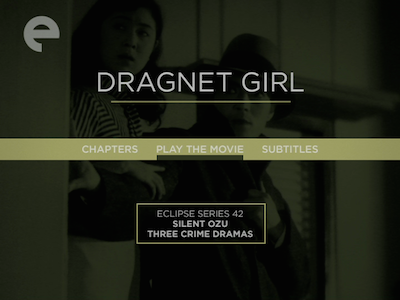 As the drama ramps up, Dragnet Girl crosses similar territory as Walk Cheerfully [review]. Misako’s positive presence inspires Joji to consider getting clean, and though she initially goes to the record shop with a gun to confront Misako, Tokiko is quickly smitten with her, as well. 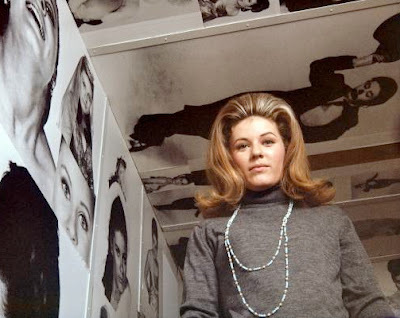 She thinks about ditching the bad-girl lifestyle modeling herself after her rival. The only one who can’t seem to get Misako’s message of peace is the one she wants to go straight, her little brother, who resists even after his hero threatens him. 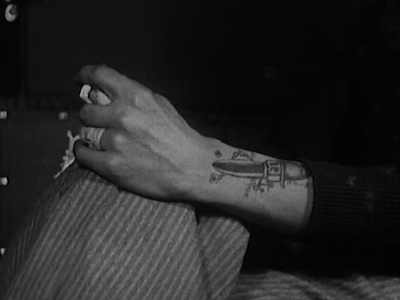 Moreso than Walk Cheerfully Ozu toys with the notion of fate in Dragnet Girl. 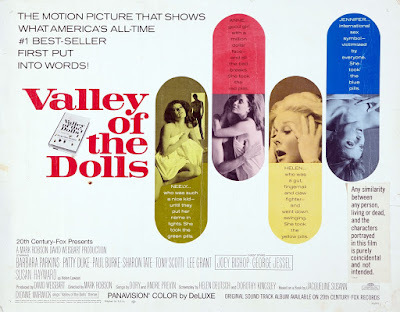 In the psychology of the script, which was written by Tadao Ikeda, the scribe behind Walk Cheerfully and The Only Son [review], working from a story by Ozu himself (hiding behind the pseudonym James Maki), we move closer to the inescapable doom of film noir. Neither Joji nor Tokiko find it easy to make a clean break, and in part because they don’t think they deserve it. 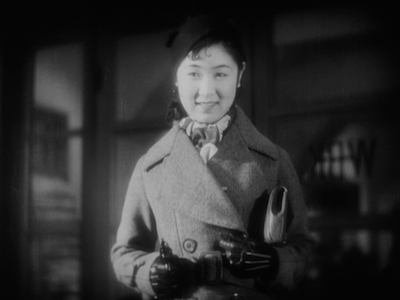 Tokiko is offered an ideal marriage by her boss, but can’t see herself stepping into a housewife’s shoes; likewise, Joji must reject Misako in order to “get over her.” When it comes down to it, the only thing that this Japanese Bonnie and Clyde can count on is each other. Whatever their path to get to true love, at least they found it together, and they can get out of it together, too. 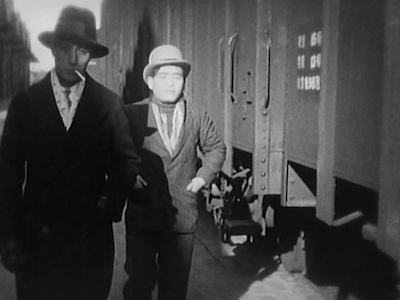 Embracing a crime trope, Ozu positions them to pull one last heist with the intention of snatching some seed money and getting out of town. It’s a pretty ballsy robbery, with Tokiko leading the charge, and an even more hairy escape when the cops come knocking. 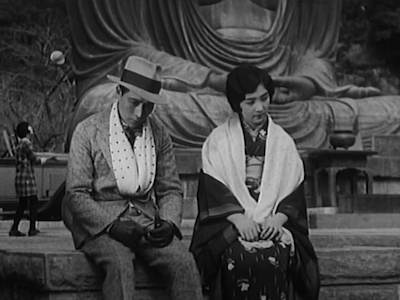 Yet, Ozu avoids the expected final shootout, seeking a different solution for his lovers. Punishment offers redemption. Dragnet Girl actually makes a pretty convincing case for sucking it up and taking your lumps. It doesn’t hurt that the impassioned argument for toughing it out is made by Tokiko. 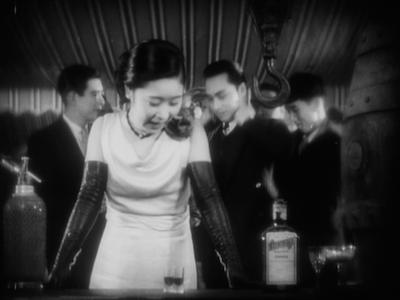 Kinuyo Tanaka has a solid screen presence, and her confident delivery, and the complex emotional swings that get her there, makes for the most convincing acting in the movie. As perfect and angelic as Sumiko Mizukubo is as Kazuko, Tanaka brings her character down to earth, so that she is both sympathetic and relatable. She’s really the only choice for the confused Joji, who frankly comes off as kind of weak-willed and not nearly as tough as he’s intended to be. 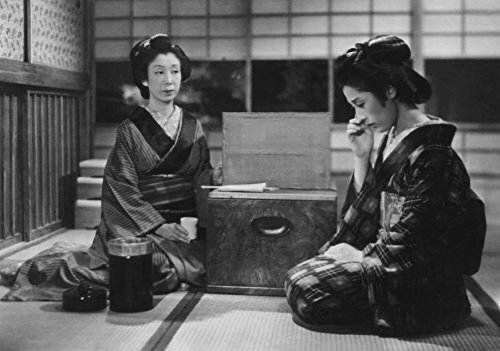 But then, Ozu’s women generally have been the ones who have had to carry the heaviest burdens, and who do so with a quiet strength unique to them. In that, Dragnet Girl is part of a long tradition of the filmmaker, even as he would soon leave its genre trappings behind. 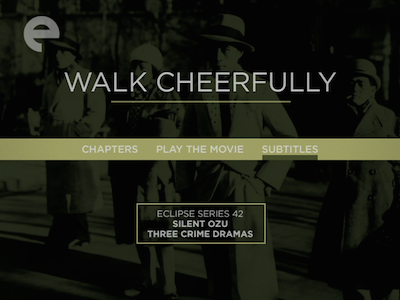 Other selections from the Eclipse boxed set Silent Ozu - Three Crime Dramas are reviewed here: That Night's Wife. If there are two types of stories that tend to be full of big emotion and drama, it’s the coming-of-age tale and the backstage tell-all. 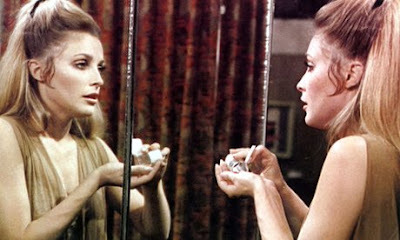 Put the two together--adolescent angst and performer’s ego--and all bets are off. 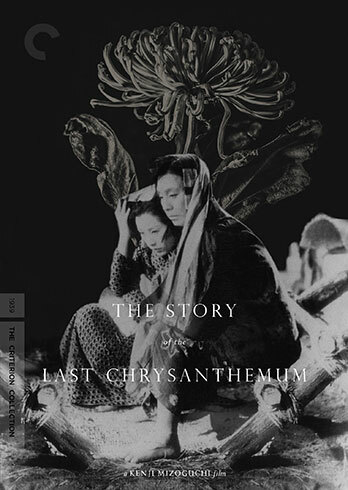 Unless, of course, you’re watching Kenji Mizoguchi’s 1939 film The Story of the Last Chrysanthemum. 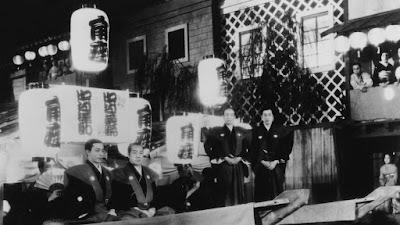 Though the script is full of melodramatic situations, including a Shakespearean split between father and son and a woman who sacrifices her health to see her husband achieve his greatest dream, Mizoguchi is determined to present it without histrionics, adopting a film style that is more observant than intimate, mimicking the experience of seeing the kabuki plays his characters perform in, shooting the entire story as if sitting in the middle seat inside the theater. No close-ups, no shouting, but heartbreaking all the same. 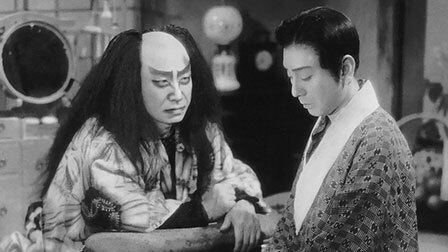 The Story of the Last Chrysanthemum follows Kikunosuke (Shotaro Hanayagi), the adopted son of one of the greatest kabuki performers of their age (played by Gonjuro Kawarazaki). Young Kiku is not a very good actor, and he finds himself torn between false flattery and bitter sniping. When the family’s nanny, Otoku (Kakuko Mori), tells him the truth, the unselfishness of her feeling for him makes Kiku take notice. He becomes determined to improve his art and make his own name in the world. Such a declaration makes him look insubordinate, however, and when the family forbids his romance with Otoku, Kiku has had enough. He leaves to strut the boards in another town. Otoku eventually joins him and they marry, but good fortune is not yet theirs. Kiku is still mediocre, and when his protective mentor dies, he is forced to trade his position at the theater for a spot in a traveling show--a much less respectable gig, but a gig nonetheless. It provides Kiku with the right experience, but little notice and little money. It will take an act of fate to reverse Kiku’s trajectory--fate engineered by Otoku, even though it may be too late for her to enjoy it. 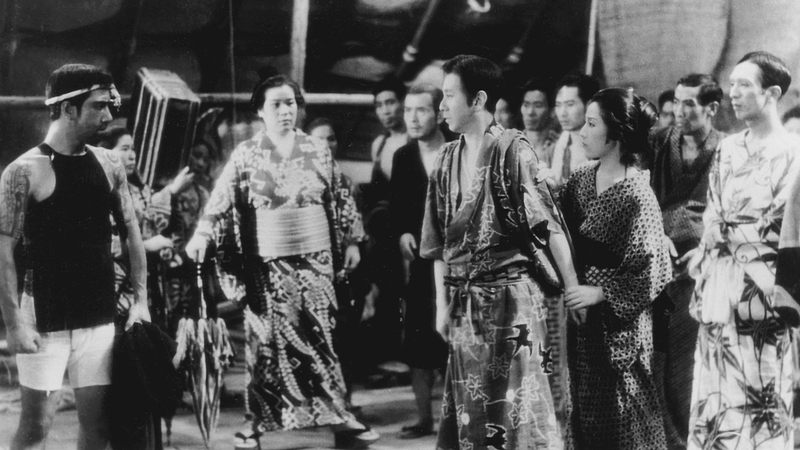 The idea of needing to suffer for one’s art is not novel to Mizoguchi, but he certainly makes it seem the least romantic. Kiku isn’t a brooding Byron engineering his own disasters; rather, he is earnest and well meaning, and he doesn’t actually see that the misery he is enduring is informing his art. 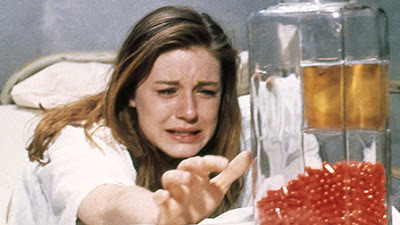 In fact, this may be exactly why he’s not so great on the stage: his inability to delve into his emotional life. The drive to be better is his only focus, and it only allows for selfishness, not self-reflection. Kiku’s perception is based on the public and critical reactions to each night’s play; luckily, he also has Otoku there to keep him motivated. She redirects his energies as necessary. The Story of the Last Chrysanthemum is equal parts A Story of Floating Weeds and Sawdust & Tinsel [review]. It is about family as much as theatre life, with the family of performers forming a secondary clan. In a way, The Story of the Last Chrysanthemum is unique in how the family rallies around the lesser amongst them, pooling their efforts to fix Kiku’s life. No man is left behind, as it were. Only in the final act does Kiku become the star of his own story. 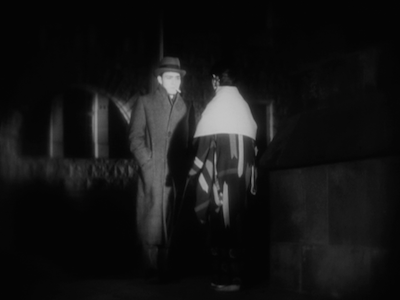 We finally see him on stage--something that Mizoguchi has mostly kept from us so far, perhaps assuming Kiku might lose our sympathy were we to see how bad he really was--showing us his comeback night, when he proves to his father’s contemporaries that he’s worthy of returning to Tokyo. 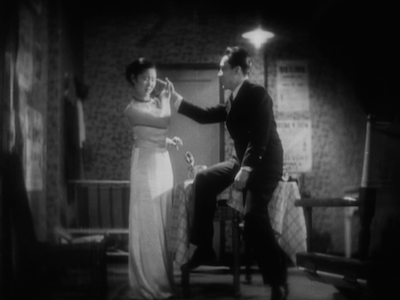 For the first time, Mizoguchi really takes us onto the stage, and we get to see the man at work. Mizoguchi fans will be drawn to The Story of the Last Chrysanthemum for Otoku as much as they are Kiku’s fall and ascendance. Perhaps moreso. Her devotion and sacrifice illustrates one of the central themes of his work, as also shown in the films in the Kenji Mizoguchi’s Fallen Women boxed set [review], where they get to take center stage themselves. 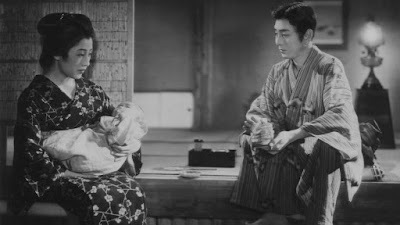 As Otoku, Kakuko Mori gives an appropriately quiet, often unassuming, but deeply felt performance. How much of the others’ willingness to try to elevate her husband is based on their sympathy for her more than their liking of Kiku? Probably most of it. 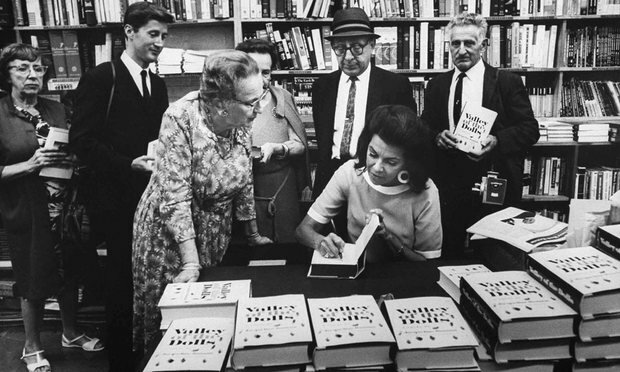 She is the best example of humanity amongst people whose job it is to reflect our own humanity back at us. Not that there is any lack of it amongst the other characters in The Story of the Last Chrysanthemum. What Mizoguchi has avoided is making the performers and stagehands seem alien; they aren’t grifters or fakes or exaggerated. Instead, they are warm and relatable, and as Kiku rises to his apex at film’s end, the filmmaker reminds us that regardless of this success, regardless of what we project on these performers, a star can also experience genuine pain.